Pressure for a resolution to a political standoff in Honduras has increased after the breakdown of talks between the two sides over the weekend. The European Union on Monday suspended aid to the Central American country, which has found itself increasingly isolated since the June 28 military-led coup that ousted President Jose Manuel Zelaya. 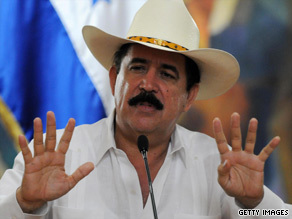 Representatives of Zelaya over the weekend failed to reach an accord with representatives from the interim Honduran government of Roberto Micheletti, who was named by congress hours after the military detained Zelaya and sent him to Costa Rica. “I very much regret that it has not been possible to this date to arrive at a mutually agreeable solution to the Honduran crisis,” said Benita Ferrero-Waldner, commissioner for external relations and European neighborhood policy. “In view of the circumstances, I have taken the difficult decision to suspend all budgetary support payments,” she said. A European Commission source told CNN that budgeted aid to Honduras totaling 65.5 million euros ($93 million) has been suspended.